From the commonplace emerges the terrifying, from the unexceptional comes horrifying evil in Hansal Mehta’s unusual biography of the dreaded terrorist Omar Sheikh. As biopics go, this one chucks all templates out of the window: Sheikh’s childhood is given a complete go-by, as are a backstory and conventional ‘explanations’ for his murderous actions in the years of his life brought to us in Omerta. 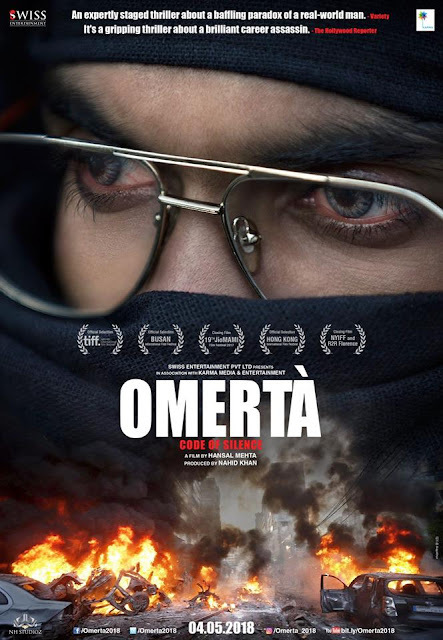 In the way these events are recounted matter-of-factly, with the film cutting between the actors and news footage, Omerta feels like a dramatised documentary feature. No overt effort is made to evoke sympathy or revulsion for the man at the centre of it all. True, we learn that he was angered and embittered by the slaughter of Bosnian Muslims – his “brothers and sisters” as he repeatedly calls them – in Europe in the early 1990s, but there is no suffering at his own doorstep, the sort that might help an ordinary viewer wrap her head around the icy detachment with which he commits unimaginable acts of violence. Omerta offers nothing to those who are invested in the idea of the inertia of human goodness (the notion, as Isaac Newton might have put it, that all people are reasonably good and will remain reasonably so unless compelled by external forces to act against their natural instincts), nothing that would allow regular folk to say “That happened to his parent/sibling/wife/child/friend/him? Ah okay, now that explains it.” Instead we are compelled to confront the possibility that a seemingly normal, intelligent, educated individual with no personal tragedy haunting him could be easily brainwashed into deep commitment to an extremist cause, or worse, that a human being could be unadulterated evil simply because he is. Perhaps we should have expected this. Mehta is not one to provide easy answers. In his 2017 film Simran, he had Kangana Ranaut playing an eccentric woman whose journey into crime is motivated not by a grand catastrophe but by a claustrophobic home, frustration at the workplace and a humdrum middle-class existence. Yet, while Simran was about a person who could have been you or me gone wrong, Omerta is about someone who looks like he could have been you or me but is far, far from it. After chronicling the manner in which he held four Western tourists hostage in the narrow bylanes of Delhi, the film travels back a short period to 1992 London, where Sheikh was a student at LSE leading a comfortable life with his loving father Saeed Sheikh (Keval Arora). His indoctrination came at the hands of another deceptively normal seeming person, the trusted local clergyman Maulana Ismail (Rupinder Nagra). From then on, as it slices through time and space in editor Aditya Warrior’s hands, Omerta plays out like a crime thriller, the anticipation heightened at each step by Mandar Kulkarni’s sound work and Ishaan Chhabra’s score. The glacial coldness with which Sheikh slips easily into a vile training camp in Pakistan and his terrorist activities are made all the more unnerving by the run-of-the-mill nature of his early days. Even as we come to terms with his part in mass murders, the vehement brutality with which we finally see him work on Pearl’s body – in Omerta’s version of the facts – comes as a punch in the gut. Anuj Rakesh Dhawan (whose DoP credits include Simran and Shubh Mangal Saavdhan) does not show the actual beheading on screen, yet manages to capture every molecule of ruthlessness in that gory scene. Whether in conveying the essence of a city or portraying such savagery, Dhawan’s camera is never literal in this film. He respects the audience enough to know that we do not need to see knife on neck to grasp the horrendousness of that crime. The lifeblood of Mehta’s film is Rajkummar Rao who is so much Omar Sheikh that he will for a long time now be the yardstick against which other actors will be measured if they are cast as Sheikh. That Rao is an extraordinary actor is beyond debate, but there has been a niggling personality trait he has not so far been able to shave off in his performances – that clipped accent, which is easily identifiable as his. In Omerta, even that quirk melts away as the actor disappears into the character he is playing. Not only does Rao erase his own personality for this role, he manages to capture the manner in which the chameleon-like Sheikh would erase his personality in his multiple real-life avatars: as Daniel Pearl’s likeable Pakistani contact, a friendly British Indian tourist in a flea market in Delhi and the boy from Southall, the south Asian neighbourhood in London. Rao’s challenge is that the camera is on him from start to finish. New York-based actor Timothy Ryan Hickernell’s is that he barely gets a few minutes and a handful of lines to convince us that he is Daniel Pearl. His minimalist acting combined with the minimalist writing and direction ensure that Pearl becomes a full-fledged person in our eyes in those few scenes, instead of being a mere statistic in Sheikh’s roster of crimes. Keval Arora is completely relatable as Sheikh’s affectionate father who knows his son is going down a dangerous path, objects to his choices, but does little to stop him. The rest of the supporting cast is just as convincing. The title, like the rest of the film, is not to be taken literally. The authorities, in Mehta and Dev’s view of Sheikh’s vision, are callous Western superpowers and other exploiters of the Muslim qaum (India included for the situation in Kashmir) who will never punish their own and therefore must be brought to justice by those they have wronged. Would I like to find out what Sheikh was as a kid, spend more time with his father and wife, meet his classmates, friends and child? Certainly, but in another film. Omerta is different. Mehta’s film is as much terrorography as biography. It does not spell out Sheikh’s motivations in black and white, but reminds us that the villain of the piece rarely looks like one and need not have reasons we may identify with, relate to or understand. Besides, Omerta’s pace is so unrelenting and Rao’s acting so immersive that it is impossible to turn away from the screen for a single moment of the film’s compact 97 minutes and 37 seconds. To call it gripping might be an understatement.